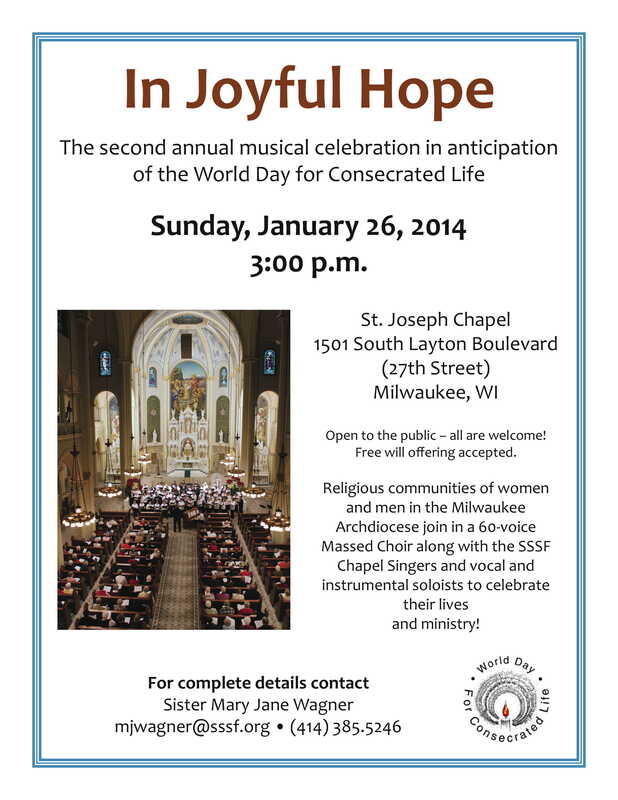 The School Sisters of St. Francis invite you to join us this Sunday, January 26, at 3:00 p.m. as we welcome instrumental and vocal soloists, the SSSF Chapel Singers, and a 60-voice massed choir of sisters, brothers, and priests from throughout the Archdiocese of Milwaukee for “In Joyful Hope,” an hour-long concert in celebration of consecrated life. The performance will be held in our historic St. Joseph Chapel, 1501 S. Layton Blvd. (W. Greenfield Ave. at S. 27th Street), Milwaukee. Attached is a flyer and news release about the event. And if you’re able, come early and visit our Alfons Gallery (just down the hall from Chapel) for the opening reception of our exhibit “Illuminating Past Lives,” featuring the paintings of Brookfield artist Janet Roberts. Ms. Roberts will be on hand from 1:00-4:00 p.m.
We hope you can join us this Sunday for a delightful afternoon!